The Kelso lobby has served as the main entrance to the building since its construction in 1924. 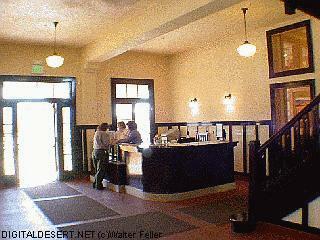 Visitors, Union Pacific employees, and Kelso residents gained access through the lobby to the depot's lunch room, or beanery, basement recreation rooms, or lodging rooms, as appropriate. An attendant, or lunch room manager, at the lobby desk behind the counter staffed the cash register, ringing up beanery customers, and assigned the second floor rooms to UP workers in need of a room in which to sleep while in Kelso. A few small items were available for sale at the lobby desk; originally cigars were showcased in the lobby display, in 1954 and perhaps later cigarettes were sold, and by the 1960s milk was available here. In the 1930s other items such as candy and gum could also be purchased, and they were displayed in a vertical case, kept cool with blocks of ice, at the side of the stairs to the second floor. In the post-war years difficulties with transients and some temporary workers in the area led to people sleeping on the floor in the Kelso Depot lobby. Mr. C.A. Keller in the DC&H Department in Ogden, UT thought that "extra gang laborers, most of whom are Indians, come into Kelso for a day or two before receiving their money….without funds, would take care of themselves during the day, but at night when it was cold would come into the lobby and sleep on the floor and made somewhat of a nuisance of themselves. It is not often they become unruly however." Roadmaster Simmons attributed the problem to "...transients moving through Kelso on freight trains... board the trains either at Las Vegas or Yermo and by the time they arrive at Kelso they are cold and hungry so they get off the train and make Kelso their headquarters. However, I will do what I can to discourage laborers from receiving their time vouchers at Kelso." While not a regular occurrence, it was nonetheless troublesome for the depot manager.